Hailed as the "best writer in the West on Chinese food", Fuschia Dunlop has previously written two critically-acclaimed cookbooks, Sichuan Cookery and Revolutionary Chinese Cooking, a cookbook of Hunan dishes combined with the history of the province. Her latest book, Shark's Fin and Sichuan Pepper, is billed as a "sweet-sour memoir of eating in China". But more than just a delicious memoir of extraordinary meals, Shark's Fin and Sichuan Pepper is also an erudite, nuanced look at Chinese culinary culture, its history, and China's development over the last decade. Intrepid to the point of foolhardiness, as she is described in a review by The Guardian, Dunlop spoke to anyone, went anywhere and tried eating everything. But it is her stories of the Chinese she me that hold the attention. She also explores the ethical and environmental implications of her omnivorous diet. 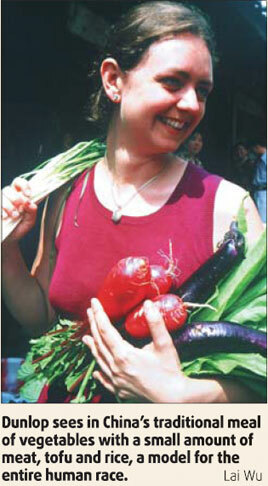 Fuschia Dunlop began her journey into China's culinary culture in 1994 when she first arrived in Chengdu. She became distracted from her original plan to study Mandarin and China's minority peoples after immediately falling in love with the cuisine. Initially skipping classes in favor of watching restaurant chefs at work, she then enrolled in the Sichuan Institute of Higher Cuisine, becoming the first Westerner ever to study at the institute. Her experiences at the institute and in Sichuan shaped her first cookbook, Sichuan Cookery. A cookbook that combines recipes, folk tales and cultural origins of each dish, Sichuan Cookery introduced English-speaking audiences to a cuisine that has a fare wider context than its hot and spicy reputation. After the publication of her second cookbook on Hunan cooking, where she explored the dishes that Chairman Mao ate and the origins of General Tso's Chicken, a popular Chinese-American dish believed to be representative of Hunan, she decided to write a somewhat different book; one that would allow her to explore China's culinary culture and historical aspects in greater depth. Shark's Fin and Sichuan Pepper takes readers on an epic romp through regional cuisines as Dunlop travels China. A self-described British meat-and-fish eater, living in China allowed Dunlop multiple opportunities to expand her gastronomical horizons. Dedicated and ruthless in her desire to eat everything that China has to offer, Dunlop moves from one glorious meal to another. The book tells glowingly of gelatinous camel's foot in an imperial restaurant in Beijing; sheep intestine sausages from a street vendor in Xinjiang Uygur autonomous region; and a freshly slaughtered snake's blood cocktail in Fujian province. While Dunlop believes that most Westerners are willing to push boundaries, palates less adventurous than hers have been daunted at how the Chinese eat practically everything. Cuisine is inextricably tied to cultural identity, and as the old saying goes, you are what you eat. "It's not an easy thing for a traveler to go completely native in her tastes," she writes, especially when the new cuisine has ingredients and textures that range far beyond a traveler's comfort zone. The Chinese concept of "mouth-feel" is especially difficult to bridge, as texture plays an important part of what Chinese consider to be appetizing. As she explores China's rich variety, Dunlop gains a new appreciation for offal and an understanding of texture's role and cultural significance to the Chinese gourmet. Along the way, she learns about much more than food as her fascination with culinary culture leads her down unexpected paths. To Dunlop, language and cuisine intertwine. "Learning another cuisine is like learning another language. When you learn a language, you learn the grammar and examples to reproduce and make up the sentences. I learned the basic processes: the art of cutting, how to make the flavors, the art of the wok, controlling the fire. Once you learn the patterns of the cuisine, you can start being creative and play around with the basic grammar," she says. Key to Dunlop's success, both as an adventurous eater and a culinary scholar, was a curiosity born of being an outsider. Dunlop is fluent in Mandarin and steeped in Chinese culinary cultures, yet her own background is completely different, giving her a critical distance that allows her to bridge Chinese and British cuisines and traditions. She is also able to bring to her books an ability to make Chinese cuisine more accessible to English-speaking audiences who are unfamiliar with Sichuan spices or the textures of offal. Shark's Fin and Sichuan Pepper ends on an interesting note on the gourmand's place in a world where the local and organic movements are gaining momentum and the global supply of food animals is rapidly being depleted. After eating her way through everything, Dunlop has very few taboos left, other than one that is crucial: endangered species. For instance, although the shark's fin of her book's title is popularly feted as a traditional Chinese delicacy, Dunlop won't eat it again. But just as eating in China raises questions for Dunlop, she also finds in Chinese cuisine some of the answers that have been there all along. Dunlop sees in China's traditional meals of vegetables with a small amount of meat, tofu, and rice, "a model for the entire human race" because it has "minimal environmental impact, is nutritionally balanced, and marvelously satisfying to the senses." 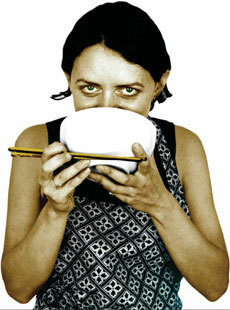 "There's a great pleasure in eating modestly and ethically," she observes, "and we'll all have to learn how to do it."